Sunny condo immediately adjacent to the Ellwood Mesa Preserve with water views of the new expanded Devereux Slough. Walk to the uncrowded beach. Bird watch at the Devereux Slough. See one of the the largest US Monarch Butterfly roost (in season). Attend lectures, sporting and cultural events at UCSB. Downtown Santa Barbara is only 15 minutes south while Santa Ynez Valley wine tasting is approximately 45 minutes to the north. Downstairs the living room opens up to a Mediterranean inspired sunny courtyard that leads out to the 650 acre Ellwood Mesa - Devereux Preserve. An open kitchen with granite counter tops, laundry room and 1/2 bath complete the downstairs. Upstairs the master bedroom provides a panoramic view of the former Ocean Meadow golf course* and beyond that the Ellwood Mesa Preserve. The guest bedroom, with two single beds, has views of the Santa Ynez Mountains. The full bath has recently been remodeled with tumbled stone details. Close to the Santa Barbara Airport. This condo is verified by UCSB's KITP. 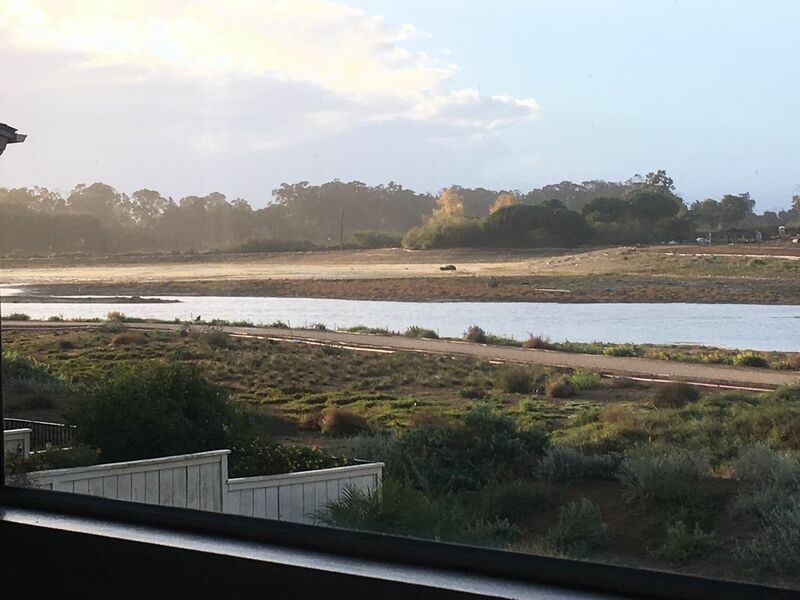 'The Trust for Public Land is working alongside the California State Coastal Conservancy and the University of California at Santa Barbara to purchase the Devereux Slough and restore it to its natural splendor. However, both the Glen Annie and the ocean front Sandpiper Golf Courses are within 3 miles of the condo. Born during Fiesta, I would roll my eyes when my Dad said 'this is the most beautiful place in the world'. Having now lived abroad and traveled extensively my husband and I have to agree Dad was right. We love it here and take pride in our hometown. We are now raising the 4th generation of south coast locals. We would love to share it with you as we know you too will fall in love. The condo provides a perfect balance between quiet country with city closeness. Steps from 100s of acres of public nature preserve and uncrowded beaches yet only a few miles from the airport, UCSB, shops, restaurants, movies theaters. Condo fronts on the former Ocean Meadow Golf Course. No longer operating it now provides open space for walking and biking. Condo front on former Ocean Meadows Golf Course. No longer operating, it now provides views of open space in a natural transition from Golf Course to habitat. Some pantry items are included. Varied. A few books in a lending library in the guest room night stand. Feel free to trade! On one side you are close to everything from gourmet restaurants, movie theaters and Costco. On the other side 700 acres of open space and Ann uncrowned (even in summer) beach. This sunny condo was a super place. Our month stay was very nice. The condo location was close to shopping, short drive to most beaches, close to main transportation routes, and a very nice and safe place to walk. We recommend this to all . This is a well appointed condo in a beautiful location right on the Ellwood Mesa Preserve and Devereux Slough. Will definitely go back! The condo looks out onto a newly created refuge. The Pacific ocean lies beyond. Very peaceful, with lots of bird activity. All amenities: well stocked kitchen, comfy bedrooms and baths, lots of closet space. My family of 4 (2 adults, 2 kids) stayed in this beautiful place for 5 weeks this summer for work at UCSB. The owners were excellent and helpful, providing extra information on restaurants, hiking trails, etc. and easy to communicate with. The unit itself was perfectly set up - light and airy, beautifully decorated, and well appointed (towels, sheets, kitchen). Beds were great and it felt like home away from home. The neighborhood was fun for all of us and we met some really great families, pool/spa area was well kept and clean, and all in all a fantastic place to stay. We rode bikes to campus, went for walks/bike rides/runs to beach, strolled to restaurants, etc. Easy living and would love to stay here again for work or play! I was a little reluctant to write this review because I wanted to keep this place to myself. But as my wife and I have gotten to know the owners, who we like very much, it seemed only fair to them to let other people know how great this place is. Suffice it to say that we love the place. We come here often and would be loathe to stay elsewhere. Bring you bicycles. You can ride down to the beach or along the beach cliffs - spectacular. The Ellwood Preserve is also a great attraction. Shopping is bicycle close. I stayed here a month to be close to my father who is in a nursing home in Goleta. The owners were really nice and helpful. It's a lovely place with great sunlight and a backyard that overlooks a nature preserve with walking/riding trails. The house is fully equipped (e.g., washer and dryer, coffee maker, internet, basic TV with on demand). It's located in a townhouse development about a mile or so from the main shops/supermarket. Goleta is fairly low key, not far from downtown Santa Barbara. There is a public beach nearby and the UCSB is a short drive away. I would definitely stay here again. To confirm the booking, the lessee pays the sum of $500.00 (+ 5% processing fee if paying by bank draft, bank wire or credit card) as a non-refundable holding deposit. The holding deposit is non-interest bearing. If you must cancel your reservation your holding deposit will be forfeited. Rental payment subject to 5% processing fee if paying by bank draft, bank wire or credit card.